Past experience has shown how extremely busy you, our educators are, so we are providing all the information you have requested previously in a format that will have all you need in one place & reduce time spent trying to find it.This may be printed out so you can share with other contacts and use as a reference when needed. * * *FAQ: What is the “NEW” show?-The ‘Warriors Through Ancient Civilizations” tour now reflects changes made to the Grade 4 curriculum which may also be of value to grades other than just 4. From Alexander the Great, we travel through the Greek, Roman eras & end with the Medieval Age.- Era-appropriate armour, weaponry plus the excitement of gladiator games, a chariot run, sword fights, and Medieval tournament-style mounted games, light & heavy armour jousting will be experienced. Please note we are a full-contact troupe, not a dinner theater show. This is the “Real” thing! Our Birds of Prey portion begins with falconry from the days of Genghis Khan traveling through to the Middle Ages showing various raptors in flight. 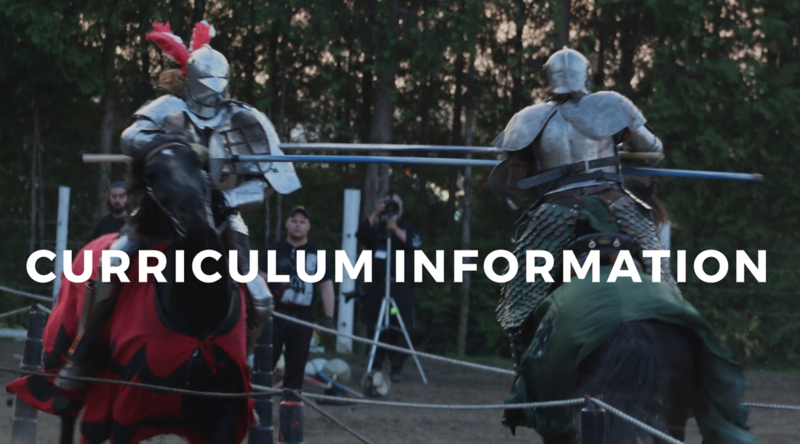 Knights of Valour staff will divide the audience (keeping schools together) into smaller groups to attend our “Educational Pods” which are designed for more depth of knowledge in specific areas & a closer look at the various characters & equipment used throughout the show. Kids can touch & ask questions at this point. 1. Siege Weapons: Our very own Trebuchet will be discussed & demonstrated with some students having an opportunity to try out our ‘mini’ versions. 2. Arms & Armour: In addition to our Medieval arsenal of weaponry & armour, we will add aspects of Egyptian, Macedonian & Roman styles – from the Bronze age to the Iron age. 3. Evolution of the War Horse: Horses will be on display & the progression of use of war horses will be discussed from the history of Ulysses, through the Romans to the Medieval Age of the mounted Knight. The most important bond between warriors & their trusted steeds will be expanded upon. 4. Birds of Prey: A closer look & deeper history /demonstration of how important these raptors were both in sport & war throughout more ancient times up to the Medieval Era. 5. Warriors of the Past: Discussion of the ancient civilization warriors–their status in the feudal systems –their training –their day-to-day lives & other relevant information giving students an idea of the hardships and honours for these real-life men & women who were not video characters. "The Knights of Valour capture the very essence of medieval jousting and are also a highly effective educational tool." "The Knights of Valour bring the Middle Ages to life in a spectacular fashion." "It's like having a real Knight come to life right before their eyes." "Its educational value is immeasurable."